Large companies no longer have to spell out what they pay men and what they pay women or what they pay whites and what they pay blacks, a rule that had been aimed at promoting pay equity. WASHINGTON — We’ve all become bit players in Donald Trump’s bizarre reality show, but behind the bluster, he’s altering our lives through dramatic changes in regulations. We quake with anxiety that he might get us into a catastrophic war with North Korea. Then we gasp when he threatens to deport 800,000 of the best and brightest. We puzzle over his touting of a nonexistent tax plan. And he stuns by equating racists and neo-Nazis with opponents of hatred and discrimination. We nervously watch him try out different, often competing, ways of governing by bullying and whining. We’re aghast at his lack of knowledge and pathetically small vocabulary. We wince as he embarrasses us, alternating between flattering and threatening world leaders. We can’t even look forward to being fired and returning to real life. This nightmare will not end soon. Behind the diversion of obnoxious rhetoric, mendacity (1,100 outright lies since Jan. 20) and nail-biting uncertainty, and in between and even during killer hurricanes, Trump and his people are doing extreme damage. Americans may hate the bureaucratic nonsense government often engenders. But when they can catch their breath, they will be horrified at what Trump has done. The White House boasts that Trump has killed or weakened 860 regulations. Trump, who excoriated former president Barack Obama for using executive orders in frustration when the Republican-led Congress refused to do anything he asked, has himself issued dozens of them. The man who insists he must follow the law by threatening Dreamers (young immigrants illegally brought to America when they were under 16 who now attend school, have jobs or serve in the military) pardoned Joe Arpaio, convicted of unconstitutionally torturing and imprisoning people. Here is a tiny sampling of what Trump is doing. More people will die in bed because mattresses will no longer have to be as fire-retardant as they are now. Construction site workers will be more likely to be run over by vehicles. Hundreds of endangered species will no longer be on the list for protection. New safety regulations on how meat and poultry are processed, in the works since 2001, will not be pursued. A requirement that federal contracts be issued only to firms that comply with 14 labor and civil rights laws, including equal pay for women, has been dropped. States may no longer create retirement savings plans for private-sector workers. States no longer have limits on drug tests for those receiving unemployment benefits. Financial advisers will not have to act in the best interests of their clients. Employers no longer have to keep records of worker injuries, and the federal government will no longer publicize worker injuries. Government contractors no longer must disclose violations of labor laws. Judges no longer have discretion over handing out lenient criminal sentences. Private prisons will not be phased out. Law enforcement may seize assets of suspects not convicted of a crime. Toxic waste dumps slated for cleanup will be ignored. More waterways will not have to meet federal environmental protection standards. Power plants have fewer restrictions on emissions of greenhouse gases. 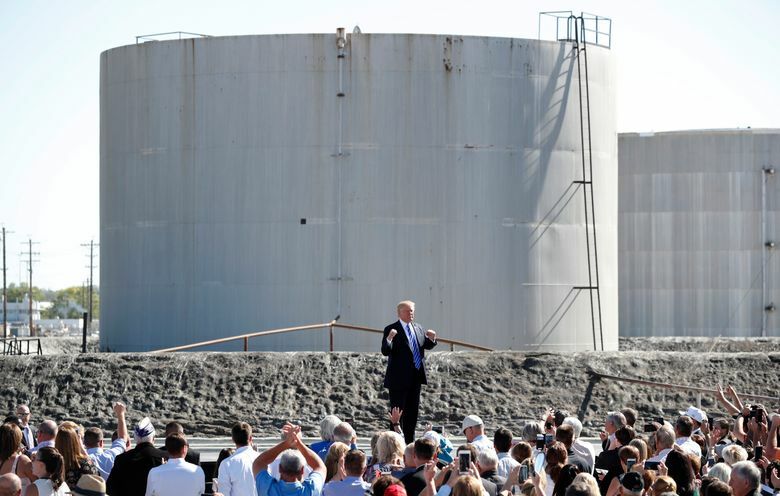 Regulations that require chemical companies to reveal what is in storage tanks (an issue in Hurricane Harvey) are disappearing. Federal standards to make natural-disaster-ravaged infrastructure more resistant to flooding when rebuilt have been revoked. Money to let Americans know how and when to sign up for affordable health care is being slashed. Efforts to stabilize Obamacare to preserve insurance for millions are being ended. The military will no longer accept transgender Americans. Local police departments once again can have access to excess military equipment such as tanks, bayonets and grenade launchers. Oil and gas companies no longer have to report payments (bribes) to foreign governments. The number of people eligible for overtime pay has been greatly decreased. Oops. Out of space. Just know that Trump says he intends to get rid of 80 percent of all federal regulations. Trump’s world is dog eat dog. He is making that our world as well.